What is single photon emission computed tomography? 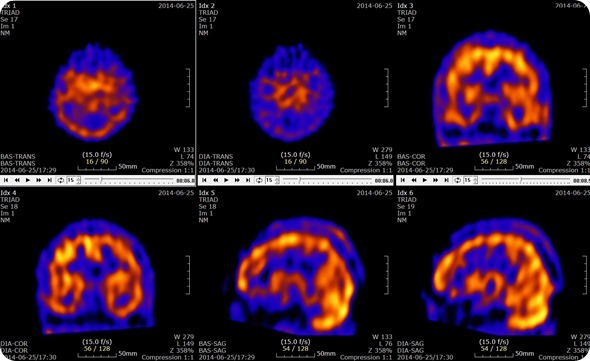 Single photon emission computed tomography (SPECT) is a form of non-invasive nuclear imaging used in order to determine how organs inside the body work. The scan can be used to illustrate how, for example, the blood flows into the heart and chemical reactions that are happening in the body. SPECT scanning is similar to positron emission tomography (PET), as both use the injection of a radioactive tracer; for the SPECT scan, the tracer remains in the patient’s bloodstream. There are three main tracers used in SPECT imaging: technetium-99m, iodine-123 and iodine-131. The radioactive tracer then emits gamma rays (a form of electromagnetic radiation), from the patient; which contrasts with the PET scans which emit positrons. These rays are then detected by the gamma camera which rotates through 360 degrees around the patient. This rotation around the patient enables the cross-sectional images to be assembled three-dimensionally as in computed tomography. This means that the resulting images are able to be viewed either as a three dimensional entity or as a series of thin slices through the subject. SPECT has several different applications, which make this form of imaging convenient for the medical profession. It is also much cheaper than PET scans although it provides a lower resolution image, with a resolution of only 1cm. This lower resolution is, however, acceptable for a variety of purposes and the fact that it is cheaper than the PET scan make SPECT scans much more readily available. Cardiac SPECT scans can be used to inspect the blood flow through the heart - areas of the heart with poor blood flow will appear dark, while those with good flow will appear light. The scans can also be used as a nuclear stress test, where they are performed at rest (before exercise) and during exercise. These scans are able to give an idea of how the heart is able to handle work - if both scans display normal results then the heart is functioning well. The scans could also illustrate a blockage in one or more of the coronary arteries - this is shown by an area with little or no uptake of the tracer. If the test proves abnormal during both exercise and rest, this would be indicated by an area without any tracer visible. This means that there is a lack of blood flow through that particular area, possible if that area is ischemic. SPECT scans can be used to diagnose hidden fractures in bone, such as shin splints and stress fractures because areas of bone healing usually light up on the scans. The scans can also be used to monitor areas where cancer has progressed to the bones. The SPECT scans could also be used to monitor infections or assess the reactions to the form of treatment the patient is on. SPECT scans are used to determine which parts of the brain are affected by various disorders including Dementia, Epilepsy and head injuries. These are characterized by too much activity in a particular area, too little activity in particular areas or asymmetrical activity across the brain where the activity should be symmetrical. These are all determined through the comparison of the scan results to the standard normal brain scans. The flow of blood in specific areas of the brain changes as seizures begin. The change in the blood flow can be quantified on the SPECT scan, through an investigation of the differences between a scan taken before a seizure and during a seizure. This change in blood flow can be used to identify the focus of the seizures. SPECT scans can be used to diagnose maladies of the gallbladder such as acute cholecystitis and an obstruction of the bile duct. The scans can also be used to evaluate the dysfunction of the gallbladder, or to follow up on a liver transplant. This form of imaging carries minimal risk, with no greater risk than the use of X-rays. Allergic reactions to the tracers used in this process are extremely rare. Women who are pregnant or breastfeeding should talk with their doctor before undergoing a SPECT scan as the radiation may be harmful to their baby. Nuclear Medicine - What is Nuclear Medicine?